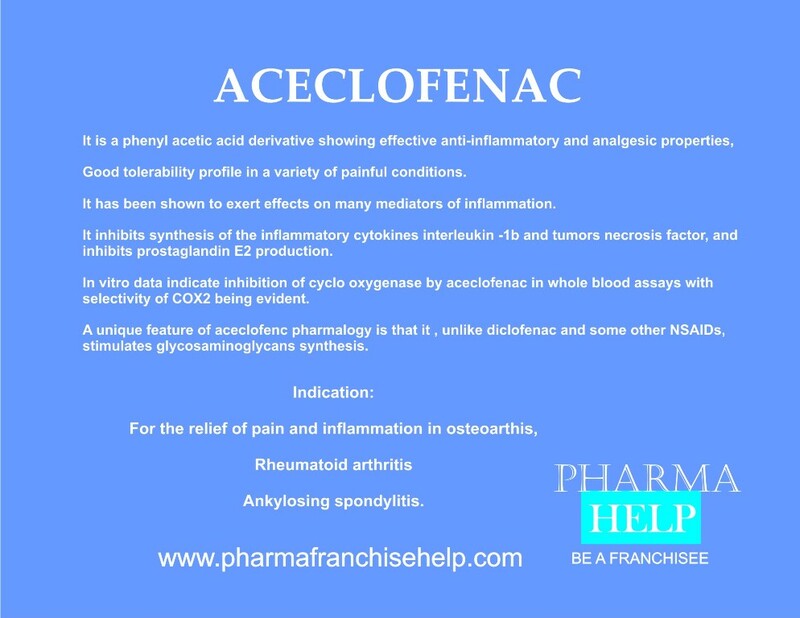 Aceclofenac is come under category NSAID (Non steroidal anti-inflammatory drugs). Aceclofenc is analog of Diclofenac. It is glycolic acid ester of Diclofenac. It is used in inflammation and pain management as a single drug as well as with combination with other molecules. Aceclofenac is cytokine inhibitors. Prostaglandins are the substances that are responsible for pain and inflammation in the body. Aceclofenac interfere with production of these prostaglandins by blocking the action of substance known as cyclo-oxygenase. Cyclo-oxygenase plays important role in production of prostaglandins. Abdal – Madhav Biotech Pvt. Ltd.
AC FC – MMC Health Care Ltd.
Aceclan – Anthus Pharmaceuticals Pvt. Ltd.
Aceclo – Aristo Pharmaceuticals Pvt Ltd.
Acefen – Salud Care (I) Pvt. Ltd.
Aceflow – B.L. Pharma Ltd.
Acemarc Marc Laboratories Pvt. Ltd.
Achenil Waksman Selman Pharmaceuticals Pvt. Ltd.
Aclo – Capta Pvt. Ltd.
Aclofen – Auztus Laboratories Pvt. Ltd.
Aclopic – Alpic Biotech Ltd.
Afen – Ambition Pharma Pvt. Ltd.
Aloo -SR – Bestochem Formulations (India) Ltd.
Aristo Aceclo – Aristo Pharmaceuticals Pvt Ltd.
Aroff BCD – Unichem Laboratories Ltd.
Ascapar – Plenteous Pharmaceuticals Ltd.
Asefan – Sanify Healthcare Pvt. Ltd.
Awnec – Shawn & Co.
Cambio – Medicaman Biotech Ltd.
Carnil AC – Azine Healthcare Pvt. Ltd.
Chronac SR – Bestochem Formulations (India) Ltd.
Clonac- Laborate Pharmaceuticals India Ltd.
Closun – Sungrace Pharma Pvt. Ltd.
Cytoflam – Cytochem Health Care (India) Pvt. Ltd.
Dolokind – Mankind Pharmaceuticals Pvt. Ltd.
Firstace – Kee Pharma Ltd.
Flamese A – Meridian Medicare Ltd.
Fornac – Forgo Pharmaceuticals (P) Ltd.
Fulnac – Ion Heathcare Pvt. Ltd.
Labace – Hiral Labs Ltd.
Lekace – J.B. Chemicals & Pharmaceuticals Ltd. Lessen – Lee Pharma Ltd.
Letgo – Orion Biotech Pvt. Ltd.
Locoace – Alchemist Lifesciences Ltd.
Moviz J.B. – Chemicals & Pharmaceuticals Ltd.
Movon – IPCA Laboratories Ltd.
Naid – Winsome Laboratories Ltd.
Nusaid FC – Molekule (India) Pvt. Ltd.
Octace – Octane Biotech Pvt. Ltd.
Octane – Octane Biotech Pvt. Ltd.
Osmoril – Kentreck Labs Pvt Ltd.
Racenac – Azine Healthcare Pvt. Ltd.
Rofaclo – Sun Pharmaceutical Industries Ltd.
Sayofen – Zota Healthcare Pvt. Ltd.
Signoflam – Lupin Laboratories Ltd.
Synovace – Cachet Pharmaceuticals Ltd.
Taurpol -Taurus Laboratories Pvt. Ltd.
Tifenac – Trigenesis Lifesciences Pvt. Ltd.
Topnac – Systopic Laboratories (P) Ltd.
Toroxx – Torrent Labs (P) Ltd.
Trifenac – Trigenesis Lifesciences Pvt. Ltd.
Valdone – Cadila Pharmaceuticals Ltd.
Varfen – Zota Healthcare Pvt. Ltd.
Vetory – Hetero Healthcare Ltd.
Wyace – Yacca Pharmaceuticals Pvt Ltd.
Zerodol – IPCA Laboratories Ltd.
Zix – Jenburkt Pharmaceuticals Ltd.
Zofen – Zota Healthcare Pvt. Ltd.